Societies rely on fresh-water systems for a variety of purposes: drinking water, food, commerce, recreation, transportation, waste dilution and decomposition, and natural beauty. Rivers and streams are valued for the uses they provide to humans. Increasingly, the environmental values of rivers, lakes and streams are recognized and valued as well. These waterbodies play an important role in the hydrologic cycle , and water flows are important to their ecological, biological, and physical integrity. Many naturally occurring and human-induced factors affect instream flows. For example, a heavy thunderstorm can cause a flash flood, whereas a long summer drought can cause some watercourses to dry up and cease flowing. Patterns of a longer term, such as El Niño, also can have an impact on flow conditions. However, human activities have had the most dramatic effects on instream flows. In particular, water withdrawals for agricultural irrigation, interbasin water transfers, and dam construction significantly influence water flows. Waste disposal into these water systems has had a dramatic impact on water quality. Instream flows are such a vital component of the hydrologic cycle that they have been recognized as a unique water use. Unlike residential water use or industrial cooling water—which occur offstream—in-stream flows are a use wherein the water is not removed from the waterway. Instream flows are seen to represent a "use" of water because they have value to society; losses accrue when society is deprived of these flows. Specific ecosystem values stemming from functioning fresh-water ecosystems include controlling floods; helping to naturally filter water supplies; maintaining fish and wildlife habitat; and conserving biodiversity . These values are the founda tion for promoting nature's use or claim to water, and the reason water flows are vital to the functioning of fresh-water ecosystems. Humans benefit from these functions and also from the recreational and aesthetic benefits resulting from instream flows. Globally, irrigation accounts for approximately two-thirds of all water removed from the hydrologic cycle. Irrigation often requires the large-scale diversion of water to production areas, and rising populations are placing pressures on the agricultural sector to produce more food. These withdrawals and diversions have had a major effect on aquatic ecosystems, and scientists have documented the decline of rivers, streams, wetlands , and other fresh-water ecosystems. One extreme example is the near-destruction of the Aral Sea in Central Asia. Since 1960, what was once the world's fourth largest lake has lost two-thirds of its volume to irrigation withdrawals. In other cases worldwide, many rivers have little water in them by the time they reach the ocean. For example, after withdrawals and diversions, the Colorado River in the western United States is often reduced to a mere trickle by the time it reaches the sea. In addition, the agricultural sector is facing increasing competition for water supplies from growing urban areas. The demands for water by various uses are increasingly in competition with one another and instream flows increasingly compete with these offsteam water uses. Increasing water withdrawals will continue to negatively affect the ability of fresh-water ecosystems to support a diversity of life. Dams have altered the instream flows of many rivers to meet the needs of society. When most dams were built in the United States, there was little concern for their potential downstream effects. The snail darter incident associated with the Tellico Dam in Tennessee in the 1970s drew much attention to the environmental changes associated with dam operations. Changes in fish and riparian (streamside) vegetation communities often were not foreseen nor considered seriously. In fact, it is the case with some earlier dams that channel segments located upstream and downstream were poisoned to remove their native fish so that sport (game) fishing could be established. Dams release water in accordance with the region's needs for water, flood control, and hydropower ; dam releases can vary widely. This practice has had dramatic effects on the river channels below dams. 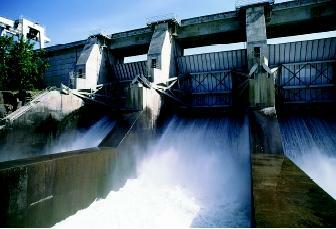 Dams release clear, and usually cold, waters. Dam releases can threaten native aquatic species and can either artificially enhance or degrade riparian soils and vegetation. Moreover, erosion and sedimentation can lead to a series of hydrologic, ecological, and economic impacts. Depending on their size and purpose, dams can have varying effects on instream flows both upstream and downstream of the dam. Rivers below large multipurpose dams may be nearly dry when the gates are closed to store water, or they may become raging whitewater when the gates are opened to release water. Here water from the Columbia River pours through the spillway at the Dalles Dam, a federal hydropower dam in Oregon. institutional mechanisms to protect instream flows vary greatly by country, and in the United States, by state. In the United States, water flows typically can be protected in two ways. First, the waters can be appropriated for "instream" uses. Water existing in the river system is viewed as being "in use." Originally, instream flows were not recognized as a beneficial use by the law. But by appropriating water for instream uses, the law recognizes uses such as recreation or wildlife protection as beneficial uses. The second method of preserving water flows is by withdrawing these flows from possible appropriation by other parties. For example, Oregon and Idaho passed laws early in the 1900s that removed certain rivers and streams from appropriation. This removal protected them from both private and state water projects. In this manner, states can protect instream flows for a variety of purposes from recreation, to fish and wildlife habitat, to water quality. The federal Wild and Scenic Rivers Act also works to protect instream flows. Passed in 1968, this act specifies that segments of rivers that contain "remarkable scenic, recreational, geologic, fish and wildlife, historic, cultural, or other similar values" may be designated for preservation. Once so designated, these areas are protected from projects that would affect water flows. This act effectively reserves federal water rights that limit future development. However, the number of rivers protected under this legislation is small relative to the number of rivers needing protection of instream flows. The Integrity of Instream Flows. While the Clean Water Act made progress in regulating point sources of pollution, other sources of fresh-water degradation still exist which negatively influence instream flows. These include altered flows from dam operations, invasion by exotic plant or animal species, agricultural runoff, and the destruction of riparian habitat from development and logging. These activities negatively affect water quality and have significant implications relating to the quantity of water flows. Despite an array of federal laws which tangentially may benefit instream flows (e.g., the Endangered Species Act), there is no comprehensive management or regulatory approach in the United States that links the protection of the ecological integrity in streams, rivers, and lakes with their water flows. Advocacy for adequate instream flows continues as integrated and sustainable approaches to managing and protecting fresh-water systems are sought. Consequently, legal rights to instream uses will continue to evolve. SEE ALSO Agriculture and Water ; Biodiversity ; Clean Water Act ; Colorado River Basin ; Dams ; Ecology, Fresh-Water ; Endangered Species Act ; Fish and Wildlife Issues ; Food Security ; Hydrosolidarity ; Pollution by Invasive Species ; Pollution Sources: Point and Nonpoint ; Stream Health, Assessing ; Stream Hydrology ; Sustainable Development ; Uses of Water . Karr, James R., and Ellen W. Chu. Restoring Life in Running Waters: Better Biological Monitoring. Washington D.C.: Island Press, 1999. U.S. Geological Survey. Dams and Rivers: Primer on the Downstream Effects of Dams. Circular 1126 (1996). How Excessive Water Use Affects Water Quality U.S. Environmental Protection Agency. <http://www.epa.gov/water/you/chap2.html> . International Rivers Network. <http://www.irn.org/index.html> . The National Water-Use Information Program U.S. Geological Survey. <http://water.usgs.gov/watuse/wufactsheet.html> . The Northwest Water Law & Policy Project Lewis & Clark Law School. <http://www.lclark.edu/dept/water/> . U.S. Code Collection: Chapter 28—Wild and Scenic Rivers Act. <http://www4.law.cornell.edu/uscode/16/ch28.html> . * See "Stream Hydrology" for a typical hydrograph showing variation in streamflow over a 1-year period.